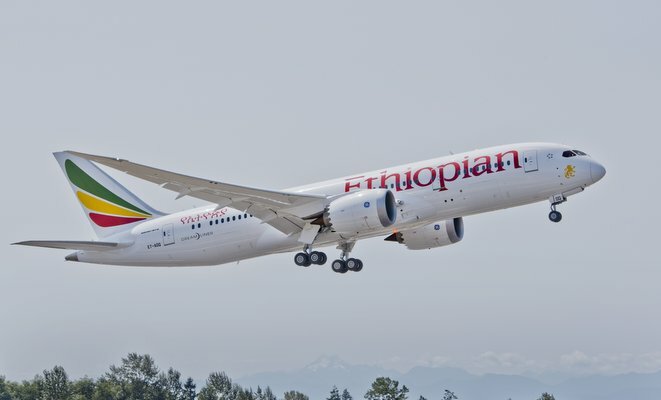 Ethiopian Airlines has taken delivery of its first Boeing 787 Dreamliner, becoming just the third airline to receive the long-delayed composite jet. The carrier received the aircraft on Tuesday (US time) in Seattle, and expected to fly it to Washington, DC before departing for the Ethiopian capital Addis Ababa. The airline has said it initially plans to use the aircraft on routes in Africa. Ethiopian, which operates an all-Boeing fleet, is the first carrier outside Japan to take delivery of a 787. United Airlines and Air India are expected to receive their first copies of the aircraft this month. Ethiopian’s 787 is equipped with General Electric GEnx engines, the subject of an ongoing investigation by US air safety regulators after a GEnx engine on another 787 suffered a contained failure during ground tests last month. 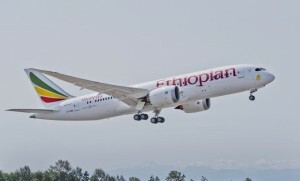 Boeing said it inspected the engines of Ethiopian’s 787 prior to delivery and found no problems with the fan mid-shaft, which has been blamed for the failure. Meanwhile, Boeing has said it feels under no pressure to launch a stretched version of the 787. Boeing has flagged plans to develop a larger version, to be known as the 787-10, but told Bloomberg the stretched likely wouldn’t enter service until the end of the decade. Boeing hopes to raise 787 production from 3.5 to 10 aircraft per month by the end of the year. The company currently holds a backlog of about 850 orders for the aircraft.